Astrology has three main goals: to know oneself better, to understand relationships, and to get an idea of the future. 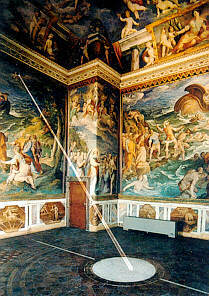 This room of the Tower of Winds in the Vatican palace is a centre for astrological observations. The picture shows the solar phenomenon that occurs on 21 March when the sunray projects a spot of light on the meridian line through a hole pierced on the wall and illuminates the astrological constellation drawn on the floor. Christendom has never been separated from astrology, even though it is not mentioned any more. Each person is unique and different. Beyond our upbringing and the experience we have accumulated with the passing of time, we are aware that we are endowed with qualities and characteristics proper to us which make us distinct from others. This constantly moving kaleidoscope of mental, emotional, and physical features can be comprehended through astrology. The primary function of astrology is to know oneself better, and in most cases, analysing our natal chart enables us not only to check that our perception of our personality is correct, but also to discover and better understand a few additional facets, and thus, to gain a more fine-tuned knowledge of ourselves and make the most of our potentialities. 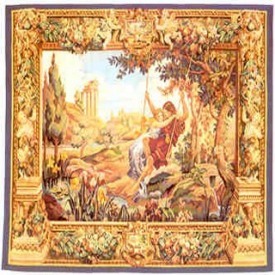 Romantic compatibilities through astrology illustrated by this tapestry by the Gobelins workshop in Paris, France: Love. Astrological tools offer an additional interesting option. 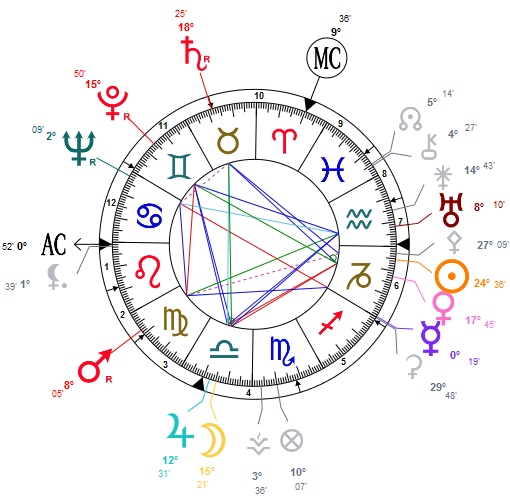 The comparison of several persons' natal charts, also referred to as synastry when dealing with a couple, explains how those persons interact with one another. What are the causes behind affinities, indifference, or antipathy, even though there seems to be no concrete reason? One of astrology's fields of expertise sheds detailed light as the astrologer analyses and compares the energies described in the natal charts. The relationship between two people is considered to become a new entity with its own strengths and weaknesses, and its own evolution. A better understanding of the forces in action is an asset which, here again, enables to broaden one's scope of action and to handle the relationship more efficiently so as to make it more fruitful for both parties. Serious astrologers know that everything is contained in the natal chart and that events unfold according to what we are. Transits, solar revolutions, and secondary and solar arcs directions activate only what exists in the beginning and must be considered as variations of the initial pattern and as triggers. Here, the chart of the death of Joan of Arc, born on 6 January, 1412 at 5:00 PM in Domrémy-la-Pucelle, Vosges, France, burnt alive on 30 May 1431. This widely practiced and well-known field of application of astrology is the most disputed one, although any astrologer having a few years of hands-on experience can but acknowledge the obvious fact that astrology works, not to mention the numerous statistical surveys which are available for everyone to read. Indeed, it is possible to predict the timing of forthcoming experiences in the various domains of life, even though such timings are only indications. We are talking about experiences or feelings rather than events. 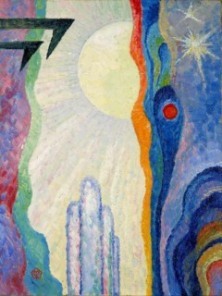 Indeed, by comparing the natal chart with the mundane chart of the day of the prediction, and by following a certain numbers of rules, astrology enables to understand the quality of prevailing energies and how they may translate in life (work, health, romance, material possessions, etc.). It must be borne in mind that the same event will not be perceived in the same way by several individuals. Astrology describes the consequence rather than the nature of the experience. It is worth noting that a given event is not perceived in the same way by individuals, and this is precisely the type of valuable information that astrology can provide, meaning that, more than the type of event, it foretells what its possible consequences may be. It has its limits, though. There is no such thing as determination, as the majority of practitioners tend to believe. Better than determinism and fatalism, a more accurate word for the activity of predicting would be probability, or even only probability of experience. When experience is strong, it is connected with concrete events, most of the time. The best way to describe predictive astrology would be to consider it like a meteorology bulletin, and nothing more. Many people do not pay attention to weather forecasts, either because they do not have the time to do so, or simply because they are not interested. Some people would never put to sea, or just go out shopping, without consulting the meteorology bulletin and taking whatever precautions are required. Thus, some prefer to optimise their behaviour so that they can properly react to the additional information that are brought to them by astrology, whereas others undergo anxiety or apathy when they experience a period of inactivity or when they are going through a bad patch. On the other hand, when we are aware of the fact that astrology describes a climate and that we are free to make our choice, even though we are influenced by what we are, but this is another story, prediction may prove valuable. It is of paramount importance that the astrologer demonstrates seriousness and humility while forecasting. Indeed, the purpose of astrology is not to offer marvellous or imaginary predictions, but to depict the weather that will prevail and to let the Consultant decide how he wants to deal with it. One may remain passive, in which case, it is most likely that predictions will partially be brought about. Or one may decide to make every effort in order to get the most of the astrological weather. In both cases, the climate would have been described, and this is what astrology is about. It is important to remember that there is no such thing as good or bad periods. Those referred to as bad are actually marked by the necessity to change because the reality one experiences does not match one's inner requirements any more. There is an exigency to evolve, as painful as might be. This situation could be compared to a rubber band that has been overly stretched and must be brought back to balance. Now, here is a last word for those who are not familiar with astrology. One should never confuse astrology with psychic phenomena such as clairvoyance. The former is a system of knowledge that can be learnt, which is not the case of the latter. Clairvoyance is a gift, and those who criticise it claim that the fact that it cannot be reproducible is the major obstacle to its spreading and its success. Be that as it may, astrology and clairvoyance have nothing in common at all. Astrology is made of a corpus of knowledge and rules which yield reliable results, provided the astrologer remains in its field of study. Other disciplines, such as numerology, tarots, chiromancy, etc. are also based on knowledge, to some extent. However, the bases of astrology are age-old and often mathematical, and its results have been scrutinised with statistical tools for a century. This is precisely what makes the difference between astrology and all the various disciplines which deal with self-knowledge and personal evolution. One ought to avoid making this mistake since, as already mentioned, astrology has nothing to do with any sort of divination or occultism, this being stated without decrying clairvoyance and other similar tools which have a complementary role (or not), even though they ought to be used with great caution. Celebrities clicked on in real-time: 577,359,065 times.